VERY PRIVATE COTTAGE. 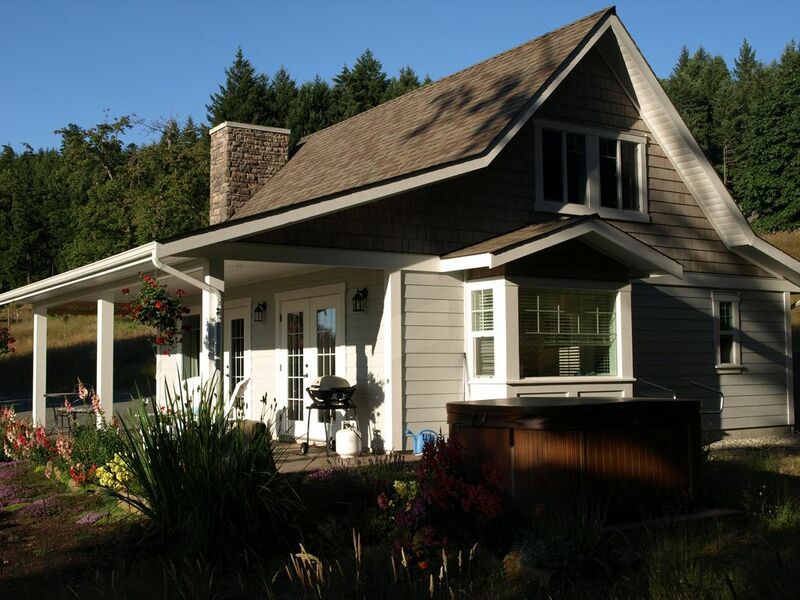 Come and relax in this Salt Spring Island accommodation with views over Vancouver island. This very peaceful one bedroom cottage is set in natural surroundings with a large variety of birds and wildlife. It is not unusual to have deer passing by your door or eagles flying overhead. Hop in the hot tub at the end of the day to watch the amazing sunsets and enjoy this beautiful setting. About Thyme cottage is fully furnished with many extras to make your stay more comfortable. These comforts include a hot tub, facilities for the preparation of breakfast, internet and satellite T.V, a luxury queen size bed with quality Egyptian cotton sheets, plush bath towels, convenient robes and much more. Please contact us for more details. The cottage is within walking distance of the ocean, and one of Salt Springs Island's many walking trails originates at the bottom of the drive. If you decide to venture out and explore the rest of the island you will be amazed at the variety of activities available; from the Saturday market to kayaking around Ganges Harbour there is a wealth of adventures. Just pick up one of the brochures we'll provide and go for it. Looking for Salt Spring Island accommodation? You found it. PLEASE NOTE VRBO PUT RATES IN US DOLLARS ON DASHBOARD. Private for cottage use only. My wife and I spent Remembrance Day weekend at Denise's cottage. It was every bit as pretty as the pictures. The view was beautiful, particularly from the hot tub at sunset (and then under the stars). The cottage itself was fully equipped, and we lacked for nothing. We really enjoyed our time in this spacious-yet-cozy, well-designed, and tastefully-decorated dwelling. Denise was a very gracious host who made herself available if we needed her. We highly recommend this cottage, and we would stay there again without hesitation. Thank you so much! Your wonderful cottage was the perfect place to relax and we went back to Vancouver feeling super rejuvenated. I just wanted to thank you for taking the time to write a review. Delighted you enjoyed your stay at About Thyme Cottage. Hope to see you for another Thyme out one day! This cottage was perfect. It has great views, wonderful sunsets, good hikes with wildflowers, and very private. The cottage was clean and had the essentials to cook a few meals. It had a washer and dryer which was great. Although, we didn't meet the owners, their daughter was more than hospitable. Would recommend this to others and we will return again. Wonderful spot! Spent 5 nights April 2016 - a truly relaxing and private stay. This cottage is very well equipped with all kitchen things needed, books, games, movies, linens etc. It's very clean and spacious set in a peaceful location. Hot tub is a lovely way to spend an evening overlooking ocean views and sunsets. Bed and pillows are super comfy!! Approx 15 mins into town that has well stocked and reasonably priced grocery and liquor stores, restaurants and shops. The Saturday craft market which is worth the trip for fresh locally grown herbs, veggies, flowers, breads and other locally made items! There are many fabulous walking and hiking trails on the island too. Denise was very flexible and helpful as we made our reservation and welcomed us upon arrival. She was quick to respond to queries through emails/texts throughout our stay but provided great privacy otherwise. We would definitely recommend About Thyme Cottage and go back again. Thank you so much for having us Denise and Ken! My girlfriend and I had a wonderful stay at About Thyme. Denise and Ken thought of everything and put such care into the little details that made us feel right at home. The view is great, a beautiful cottage, and an amazing island - we almost couldnt leave! Great place to recharge and refresh. Definetly recommend! Mary A.Where do you live? My boyfriend and I stayed in this cottage in Salt Spring. There is nothing more you could ask for from first class accommodations, hot tub, deer sightings in the front/back yard, ocean views. What a treat. We cannot wait to go back. Thanks again Denise. A network of hiking trails starts at the bottom of the drive. Beach access is a short walk away. We handle all payments to avoid the added 4 to 10% fee added when booking through VRBO.